America’s Strategy Deficit A haphazard foreign policy makes a complicated world more dangerous. On Tuesday retired Gen. James Mattis, former head of U.S. Central Command (2010-13) told the Senate Armed Services Committee of his unhappiness at the current conduct of U.S. foreign policy. He said the U.S. is not “adapting to changed circumstances” in the Mideast and must “come out now from our reactive crouch.” Washington needs a “refreshed national strategy”; the White House needs to stop being consumed by specific, daily occurrences that leave it “reacting” to events as if they were isolated and unconnected. He suggested deep bumbling: “Notifying the enemy in advance of our withdrawal dates” and declaring “certain capabilities” off the table is no way to operate. Sitting beside him was Gen. Jack Keane, also a respected retired four-star, and a former Army vice chief of staff, who said al Qaeda has “grown fourfold in the last five years” and is “beginning to dominate multiple countries.” He called radical Islam “the major security challenge of our generation” and said we are failing to meet it. 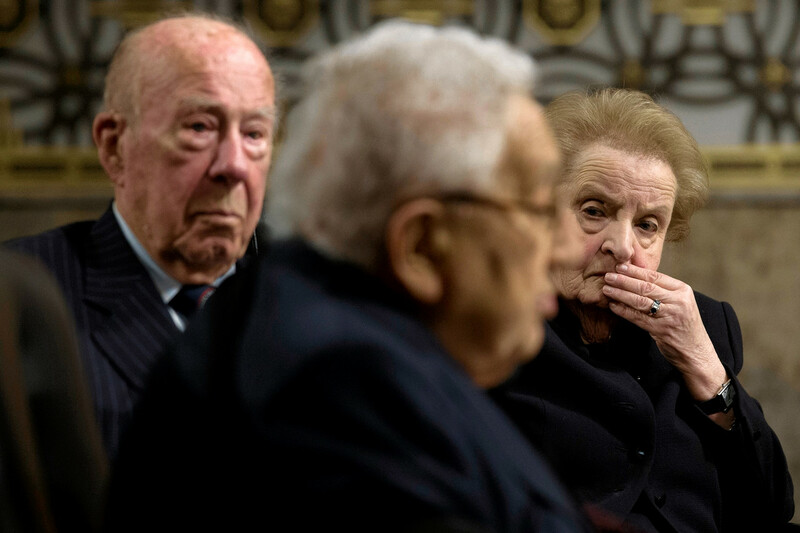 Madeleine Albright and George Shultz look on as their fellow former secretary of state, Henry Kissinger, testifies in a Senate Armed Services Committee hearing, Jan. 29. No one thinks this administration is the A Team when it comes to foreign affairs, but this is unprecedented push-back from top military and intelligence players. They are fed up, they’re less afraid, they’re retired, and they’re speaking out. We are going to be seeing more of this kind of criticism, not less. On Thursday came the testimony of three former secretaries of state, Henry Kissinger (1973-77), George Shultz (1982-89) and Madeleine Albrigh t (1997-2001). Senators asked them to think aloud about what America’s national-security strategy should be, what approaches are appropriate to the moment. It was good to hear serious, not-green, not-merely-political people give a sense of the big picture. Their comments formed a kind of bookend to the generals’ criticisms. We are living through a moment of monumental world change. Old orders are collapsing while any new stability has yet to emerge. When you’re in uncharted waters your boat must be strong. If America attempts to disengage from this dangerous world it will only make all the turmoil worse. Mr. Kissinger observed that in the Mideast, multiple upheavals are unfolding simultaneously—within states, between states, between ethnic and religious groups. Conflicts often merge and produce such a phenomenon as the Islamic State, which in the name of the caliphate is creating a power base to undo all existing patterns. Mr. Kissinger: “We haven’t faced such diverse crises since the end of the Second World War.” The U.S. is in “a paradoxical situation” in that “by any standard of national capacity . . . we can shape international relations,” but the complexity of the present moment is daunting. The Cold War was more dangerous, but the world we face now is more complicated. How to proceed in creating a helpful and constructive U.S. posture? Mr. Shultz said his attitude when secretary of state was, “If you want me in on the landing, include me in the takeoff.” Communication and consensus building between the administration and Congress is key. He added: “The government seems to have forgotten about the idea of ‘execution.’ ” It’s not enough that you say something, you have to do it, make all the pieces work. When you make a decision, he went on, “stick with it.” Be careful with words. Never make a threat or draw a line you can’t or won’t make good on. In negotiations, don’t waste time wondering what the other side will accept, keep your eye on what you can and work from there. Keep the U.S. military strong, peerless, pertinent to current challenges. Proceed to negotiations with your agenda clear and your strength unquestionable. Mr. Kissinger: “In our national experience . . . we have trouble doing a national strategy” because we have been secure behind two big oceans. We see ourselves as a people who respond to immediate, specific challenges and then go home. But foreign policy today is not a series of discrete events, it is a question of continuous strategy in the world. All agreed the cost-cutting burdens and demands on defense spending forced by the sequester must be stopped. National defense “should have a strategy-driven budget, not a budget-driven strategy,” said Mr. Kissinger. Does the U.S. military have enough to do what we must do? So we need a strategy, and maybe more than one. We need to know what we’re doing and why. After this week with the retired generals and the former secretaries, the message is: Awake. See the world’s facts as they are. Make a plan.